You are currently browsing the archives for the “songs” tag. Riley’s Pour House just keeps getting better. 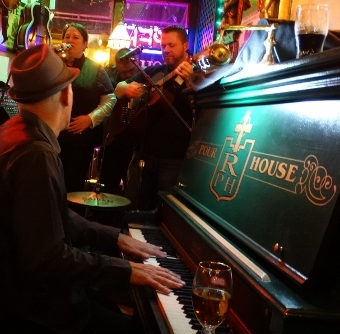 Since Jim and Cheryl Riley took over a few years back, the pub has become a mecca for people who love fun times and good music . . . and last night was no exception. My good friend Duane Davis joined me on bass and backing vocals. We’ve been playing together for years, first teaming up in a band fronted by my brother John Connolly and then in the Laughrey Connolly Band. Since Riley’s has become a gathering place for music lovers and musicians alike, you never know who is going to drop by. Last night we had a surprise visit from members of The Wild Geese Band, who took the spotlight for a late-night guest performance. Tommy B. joined them for a ringing rendition of “The Fields of Athenry.” Great stuff! 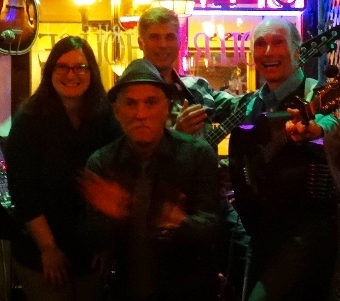 The Wild Geese will be returning to Riley’s for this year’s St. Patrick’s Day Show on the city’s Parade Day, where they’ll be headlining along side The Laughrey Connolly Band. Not to be missed! Lauren Connolly Moore helped close the night. 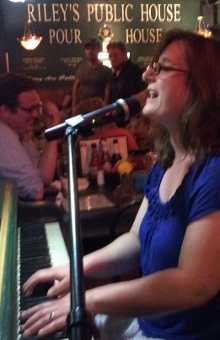 Her performances are among the many reasons regulars at Riley’s always make a point of sticking around. Whether accompanying herself on the piano or singing a cappella, she always manages to bring down the house. Last night, her performance of “Long Time Travelling” was one of the highlights of the evening. 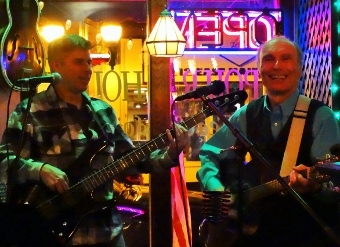 All of this goes to show why people who love good music and good times are finding Riley’s Pour House the place to be. And it’s not only a great place on weekends. Riley’s features a storytelling night on the last Tuesday of every month. This month’s session will feature tales about resolutions. I’ll be there. Until then . . . scop on! Duane Davis and Lawrence Connolly. Lauren Connolly Moore, Tommy B., Duane Davis, and Lawrence Connolly. Tommy B. and The Wild Geese. All photos © 2015 by Lawrence C. Connolly. All content is © 2010 Lawrence C. Connolly. Powered by WordPress and delivered in 0.454 seconds using 39 queries. Designed and Hosted by W. H. Horner Editorial & Design.